Im new to the hobie forum so ill introduce myself, i'm Sterling and ive had my Papaya AI for about a year now. How cool! Can you describe how it performs? And of course how did mount it? 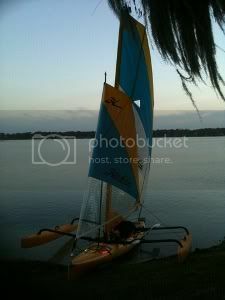 To mount the jib i first started with the standard hobie kayak sail kit (i choose the kit that matched my boat ). next i used a standard sail mount form another mirage adventure and mounted that base to my spare bow hatch. 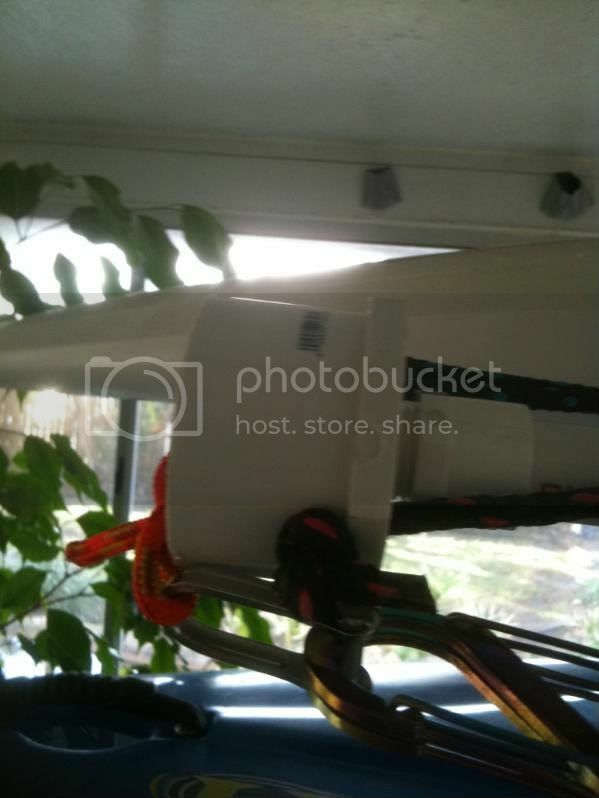 I then used marine epoxy to attach a thick 1" piece of pvc pipe around the mast base. i then used three turn-abouts (similar to the ones holding the main mast in place) to hold the new standard mast in place. This is what the underside of my hatch looks like. then to mount the top of the jib to the mast i used a #8 pipe clamp (the kind mechianics use) to hold a 1 and 1/2" long shackle and to steel cables (steel kayak rudder cable used by most other brands of kayaks). The shackle is used to hold the top of the sail and the steel cables are back stays that are used to hold the sail kit mast straight. the final attachment is the foot of the sail, there is another 1 and 1/2" shackle attached under the foot that is attached to the chrome pad eye where the bow handle is located. i ran a section of pvc pipe (dont remember the size, maybe 5/16" ? same diameter as the sail kit mast) in the sleeve where the mast should go. then at the bottom i attached a threaded end cap (again i think it was 5/16") and then threaded on a 5/16" to 2" adapter piece. this serves as a place to anchor the sail and to attach the reefing line. after everything is set up i just pull the jib's sheet and it opens right up, and when the wind gets too strong for it i can just roll it up! if ya'll want to ask me any specific questions about it ill be glad to reply back as soon as i can! Last edited by S.Yoars on Wed Apr 07, 2010 5:06 pm, edited 2 times in total. Wow, how good is that. Think we need more details!! Does it make a difference in how high you can point in light winds? Dude that is frickin AWESOME! would love to see how it performs if you can get some video up that would be wicked. Have you found that it helps keep the bow up when running with the wind? This is a truly elegant and beautiful looking jib rig. Congratulations on the design and execution. 1) It isn't clear to me from the pictures where you've attached the 2 mast stays to on the AI. They run from the top of the jib mast (there are two mast stays yes? ), but to where? 2) is there a purpose related to the jib mast setup for the pad eye that shows on the picture of your modified hatch cover? 3 it seems like the mast base piece isn't pictured. 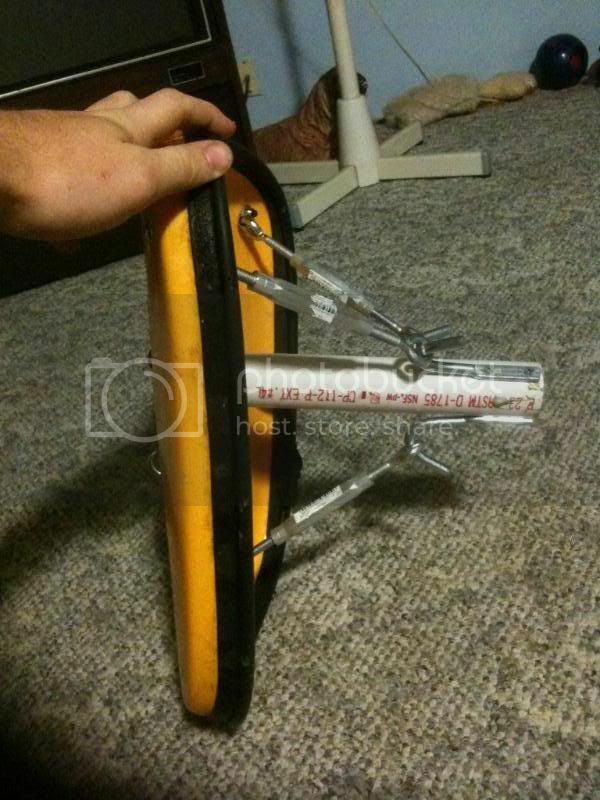 Its inside the pvc pipe yes? 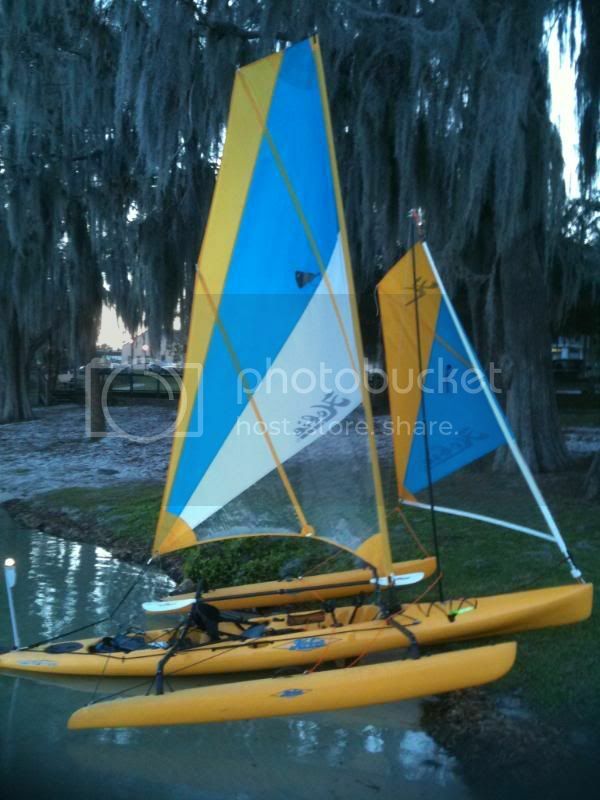 Did it comes with the sail kit, or do you have to have another boat to take it from? 4) if convenient it would be great to see a picture of the furler sometime. Its mechanism is not clear to me from the description. 5) in what conditions of wind, water, and speed have you tested this rig? How stable is it? How much extra power/speed does it provide? I think the other jib rigs described in this forum have been recommended for use in light winds only, I assume because they use the main mast which is not supported. Are there any performance drawbacks with your rig? If you have sailed with it in chop, does it affect the tendency fo the AI bow to submarine when running downwind? Cowsgomoo, the jib makes it easier to point higher into the wind in conditions lest that 10 mph or so, i have used the rig in up to 20-23 mph winds with the occasional 25 mph gust and in these kind of conditions the jib actually hinders the AI from pointing into the wind. in these conditions i furl the jib and just use the main. but to answer your question the jib does help point the AI higher into the wind in conditions less than 10 mph for sure, from 10 to 15 it is about even in point with just the main sail (but faster) and in anything over 15 i furl the jib and just use the main. when running with the wind the jib actually pulls the bow off the water. it rides almost like it is on plane (<10 mph) but since i started using the jib about 6 months ago i haven't buried the bow since. also, when tacking the bow rides higher just like it does down wind. i have noticed that if there are good sized swells (<3ft or so) when the bow drops from the crest of one wave into the trough of another the jib flutters pretty good and i lose the power from the jib for about 2 seconds. but once the boat picks up enough speed to hit the crests of every wave, i do not have this problem. sweet i thought a jib might lift the bow, now i have evidence! I look forward to your vids. Yes there are two mast stays and i took two of the photos and traced the stays in red in paint so you can see where they are. that chrome pad eye on the modified hatch was originally for the jib sheet when i was trying to make the jib self tacking. that didn't work out so well and now i use that pad eye to tie my bow lights too. I have tested my rig in light calm conditions all the way up to 20mph winds and 3 foot swells. 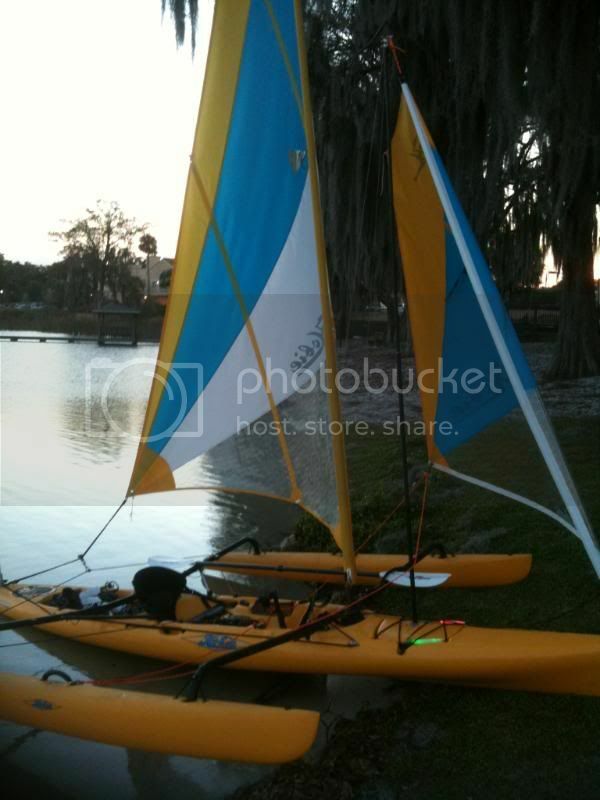 At slower wind speeds and calmer water conditions, the rig is very stable, but once the winds pick up over that 10 to 15 mph mark, the small sail kit mast starts to bend and shed most of the wind. at that point the AI follows and tends to bury the down wind Ama between 3 and 10 inches deep. needless to say this is the time when i furl the jib . In winds up to about 15 mph, the jib adds a significant amount of "get up and go" meaning the AI accelerates noticeably quicker. 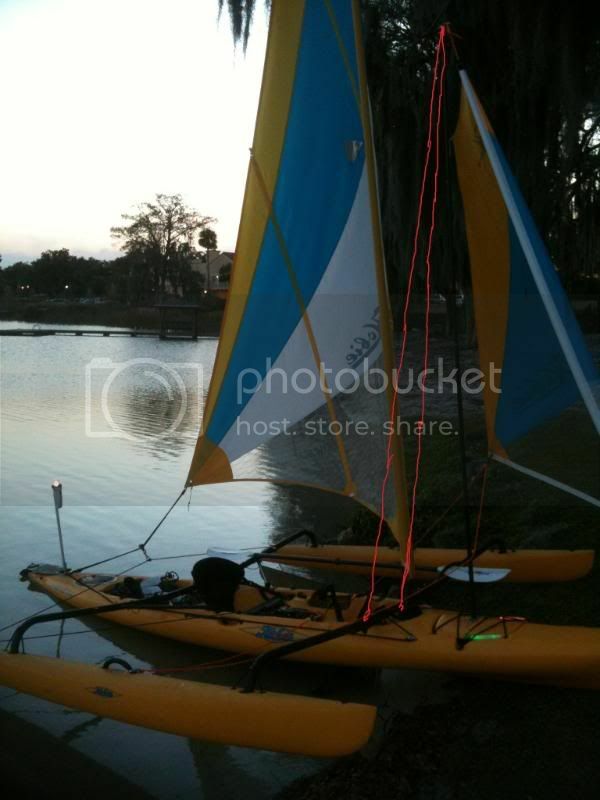 i have not tested this rig with my gps yet but my older, non-furling design allowed me to reach 16 mph in about 22 mph, verses not using the jib in the same conditions i only could reach about 11 or 12 mph. Im not going to say this rig is bomb proof, but it has held up to 20mph winds before. I have damaged (minor) the modified hatch's v-bracing once before, but other than that i have not damaged any other aspects or components of this rig. the biggest draw back to my rig would be if i choose to use the rig in high winds, (<20mph) the down wind Ama will go under water and it will slow down the AI. At that point it is best to furl the jib and just sail on the main. I have sailed this rig in chop up to 3 ft and the jib actually pulls the bow up above the water and helps to prevent the bow from submarining. 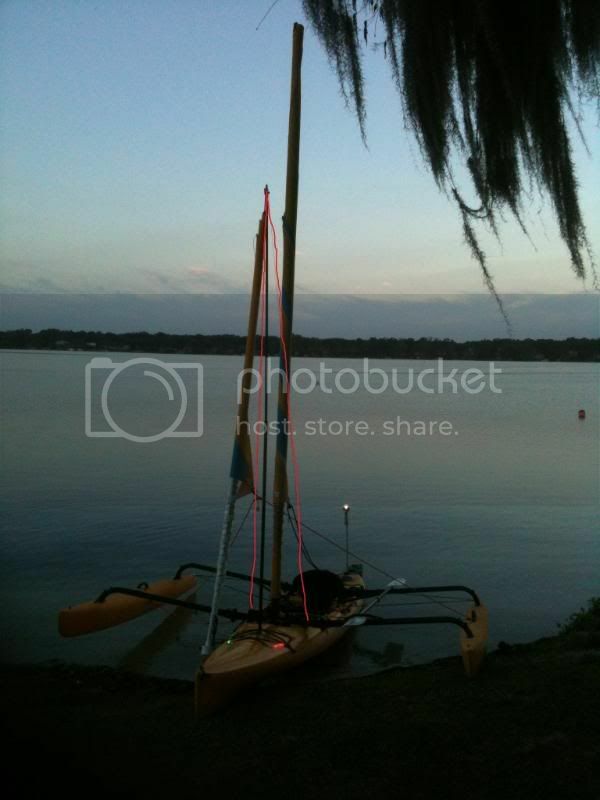 it also helps keep the bow out of the water on every point of sail i have used the jib on. Also when sailing straight down wind i have figured out that if the jib and the main are on opposite sides (i.e. sailing leaf on leaf) the AI is pretty quick down wind. I think I'm going to try to make one of these for my boat, so please forgive what will probably be an ongoing series of questions as I think this through and start gathering the parts. 1) looking at the pic of the underside of the hatch cover, there appears to be a sort of rectangular area surrounding the mast base piece and just under the four screws or bolts that can be seen surrounding the mast looking a the top of the hatch cover. Have you bolted some kind of plate to the underside of the hatch cover? Is this for reinforcement? What is going on with this rectangular area and these screws/bolts? What size bolts/screws are these? 2) Looking at the 3 eye bolt adjustable tensioners, two are fastened to the hatch cover with one kind of fastener and the third with a different arrangement. Why? 3) I know this is beginning to ask an awful lot of you, but would it be possible to talk about the list of hardware parts and where you got them? In partticular are these all stainless steel, marine grade items or did you just go to a home fix up warehouse place and get hardware off the shelf? 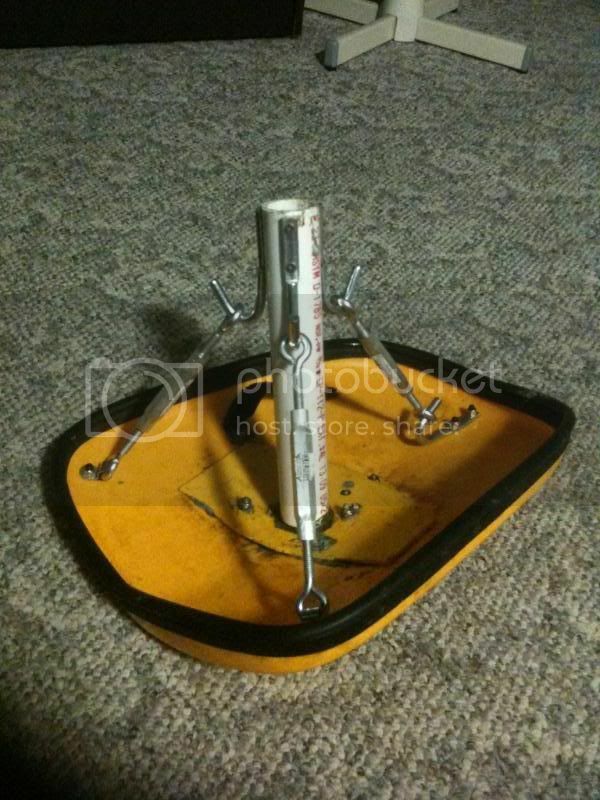 4) have you seen any increased tendency for the hatch to take on water with this rig in it? My guess would be the reverse -- less leakage. What about leaking through the bolts? Are there some kind of washers on them? 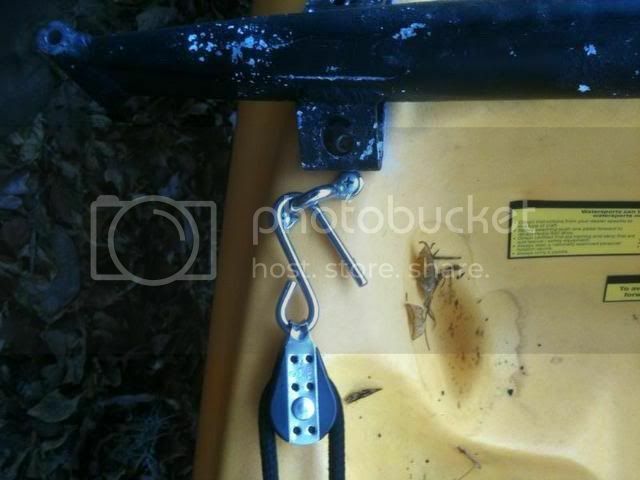 5) The mast step tensioners attach to hooks with screw plates on the bottoms. Where did these come from? What purpose are they sold for? You may regret having gotten into all of this! I'm _very_ grateful for your help on this. I definitely have to give this a go. 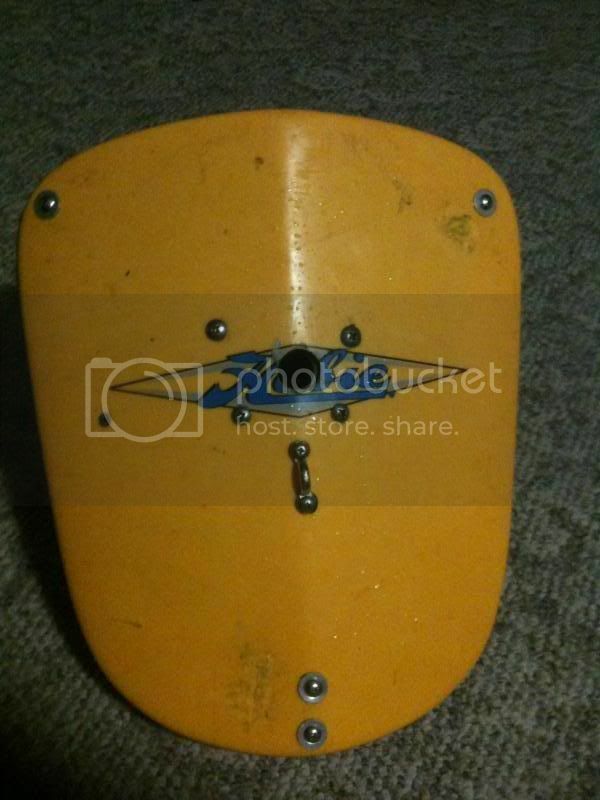 question 1 - that rectangular area of yellow plastic that you see is actually the deck piece of an old adventure kayak. i cut the mast tube out of another (damaged beyond repair) adventure and all those bolts are doing is bolting the deck of the old adventure (which is attached to the mast base) to the bottom of the hatch cover. 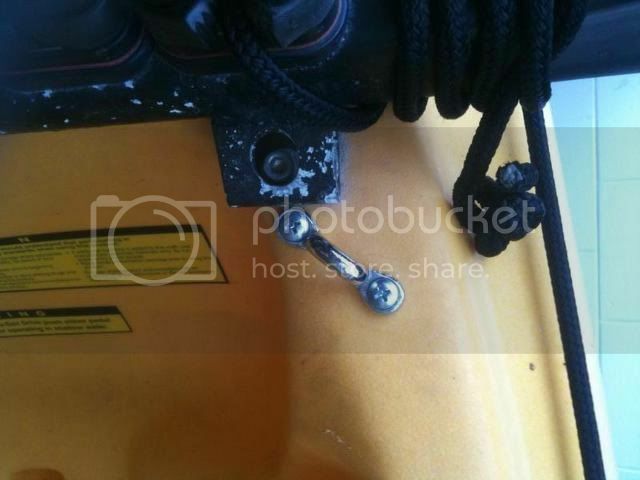 these bolts and this piece of deck are not reinforcing the hatch cover very much, it was just the easiest way to attach the mast tube with out potentially breaking the mast tube if i tried to take the surrounding deck off. 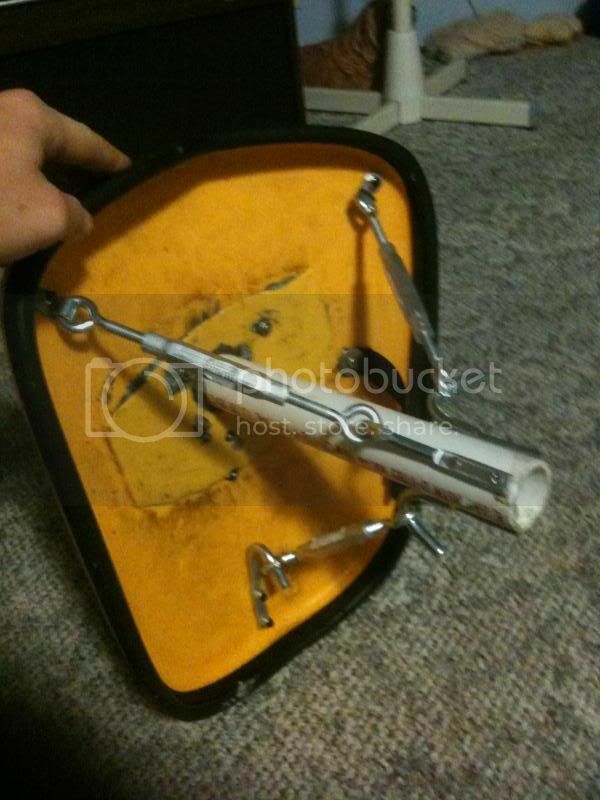 another way to mount the mast tube (the replacement masts that you can buy from hobie) would be to drill the hole in the hatch a tiny bit smaller than the mast base and wedge the mast into the hatch. there is a little lip that should hold the mast base in place near the open end. question 2 - the only reason there are two different types of attachments is because that hook style that is used on the front end was too long to fit on the back two attachments (i didnt realize that when i bought the hardware ) but i choose to use the hook style on the front just because it is sold zinc plated steel. the other two attachments are some old school deck attachments for a really old kayak i used to have and those two pieces are basically really thick ribbons of steel. question 3 - ill work on a list for you. it will take me a while i think because i have a few mid-term exams and term papers i have to get ready for but i will create a list for you has soon as i can. question 4 - i have noticed less leakage in moderate conditions, but if the tip of the mast starts bend left and right with the wind there probably is the potential that water could leak in. i have not had any unusual problems with this hatch since i started using this rig.